It was Thanksgiving on Thursday in the US. We don't celebrate Thanksgiving in Australia, but I thought it would be fun to celebrate by making a season-appropriate dish. I chose to make pumpkin cheesecake. 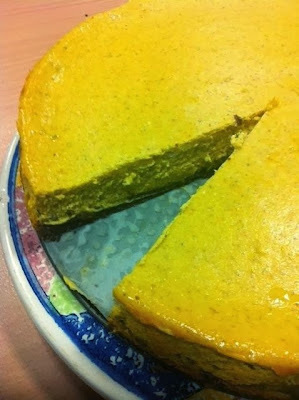 The recipe that I based it on is Sprinklebake's Sweet Potato Pecan Praline Cheesecake Bars, but by making it as a round 10" cheesecake rather than bars, and substituting the sweet potato for a cup of mashed pumpkin. For the base, I used 1 1/2 cups crushed gingernuts mixed with 1/2 cup melted Nuttelex, baked for 10 minutes at 180 degrees. 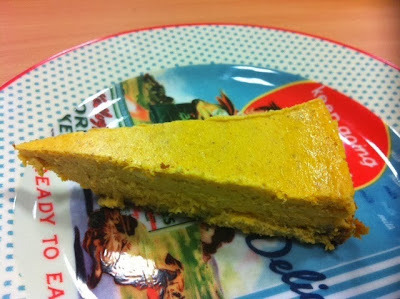 I baked my cheesecake for around an hour, and skipped the praline. I think crowd reaction speaks for itself - I put it in the kitchen for any takers, and came back 10 minutes later to find it was all gone. I thought it was delicious, but then again, I love cheesecake! I hope that all who celebrate American Thanksgiving had a lovely day on Thursday. 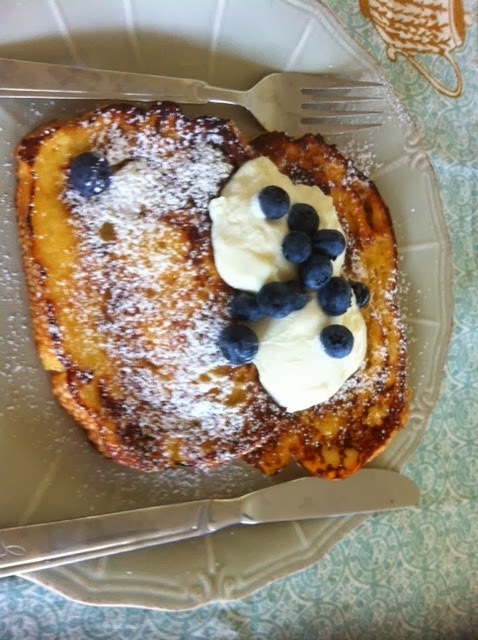 For French Friday with Dorie this week, our assignment was Sugar Coated French Toast. I didn't want to splurge on brioche, so I used Viennese bread instead, and I topped my French toast with natural yoghurt and blueberries. If you are interested, the recipe is available online here. This was nice, but not sensational. As this is only a sometimes treat, it is probably just as well that I didn't think it was amazing. To see what the other Doristas thought, visit the LYL section of the website. This week, Margaret chose Donna's potato, bacon and leek soup from p24 of Modern Classics I for Wednesday with Donna Hay. You can find the recipe online here. This soup was really, really good. This is high praise from a person who feels rather lukewarm about soup. I substituted the bacon for prosciutto (because I had some left over from the pumpkin pizza last week), and I used the cream. Yum! To see what Margaret, Kayte, Chaya and Sarah thought about this soup, visit their websites. On Thursday night, Tim and I went to the Night Noodle Markets in Alexandra Gardens, Melbourne. I had visited the Night Noodle Markets in Sydney almost 10 years ago (in 2004) with some girlfriends from work, so it was fun all these years later to be able to visit the Melbourne incarnation. The Night Noodle Markets are on from 18-30 November. The markets contain food stalls from a number of famous eateries, serving hawker-style food, with bars and entertainment. On the night we were there, the Melbourne Chinese Youth commenced a dragon dance. Both dishes were excellent value and tasted fabulous. We ate sitting on the lawns, as there were no free chairs even though we were eating at granny hour. By the time we left at around 7.30, the place was buzzing, with hardly anywhere to stand let alone sit, so my advice is to get there early (we arrived at 5.30pm; the market starts at 5pm). Gelato Messina from Sydney had some amazing looking sundaes ($9) which I couldn't pass up, so I bought two so that we could share half and half of each. It was a fun alternative dinner venue, and I would definitely go back. One of my colleagues, Jacqui, is getting married this week. 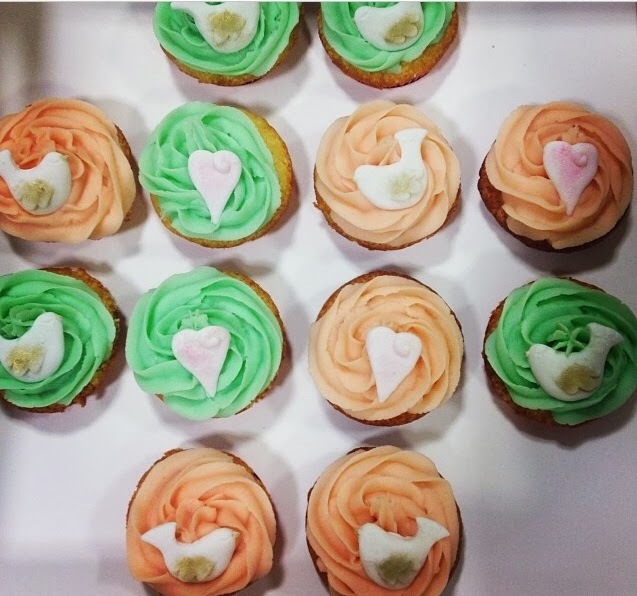 As Friday was her last day at work, I made her some cupcakes as a celebratory gift. The cupcake recipe and buttercream icing recipe that I used are from The Primrose Bakery, and are available here. This has become my go-to recipe for vanilla cupcakes and buttercream, as I get the most consistent results with this cupcake recipe and it tastes lovely, while the buttercream is pleasant tasting and minus the greasy mouth-feel. I was pretty happy with these and will definitely use this again as a wedding cake idea. It is the 50th anniversary of Doctor Who today, and as an ardent admirer of the Tenth Doctor (David Tennant), I could not let the day pass un-noticed. I wanted to make something edible as my way of celebrating the occasion, and I was initially attracted by the ideas in Dining with The Doctor by Chris Rachael Oseland. However, being a baker, when the time came, I of course wanted to make baked goods. A quick Google search led me to this recipe on the BBC America website for Mini Chocolate Dalek Cakes. While I made the whole batch of cake, I only made one Dalek - that is all I wanted, and when you start putting the little sod together, it becomes rather time-consuming. Instead of using a marshmallow head (which looked a little odd because it was smaller than the body), I had two different shaped dariole moulds (one which was tapered at the top for a head) in which I baked the cakes. I trimmed one of each type of cake up to make a dalek head and body, and joined them together with some of the ganache. I couldn't find pocky or FADS at the supermarket (my first choices for Dalek accessories), so I bought a can of yan yan biscuits and dipped them in chocolate for the plunger and eye stalk, joining on a chocolate dipped smartie (I'd used all the brown ones) and a blue smartie to the end of the sticks for a plunger and an eye respectively. I left the gun plain. The cake itself is really rather delicious - although it contains cocoa rather than chocolate, it is deep and rich and chocolatey in flavour. The backdrop for my Dalek is a first day cover of the complete set of Royal Mail Doctor Who stamps. Don't you think they are fabulous? Are you planning to watch The Day of The Doctor, being the 50th anniversary episode of Dr Who? And are you celebrating the occasion, and if so, how? For French Friday with Dorie this week, we venture into the intriguing world of salty and sweet, which sounds right up my alley. This week's recipe is salty-sweet potato far, and the name alone had me intrigued. 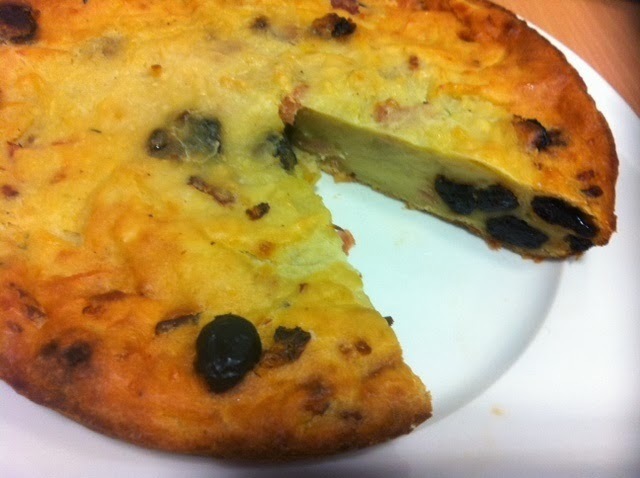 The recipe itself is perhaps not so intriguing - it is basically a huge potato cake with prunes added for the sweet part. It was quite OK to eat, even better cold, but probably not a repeat for me. Ah, such promise in the name, but it was not fulfilled for me. 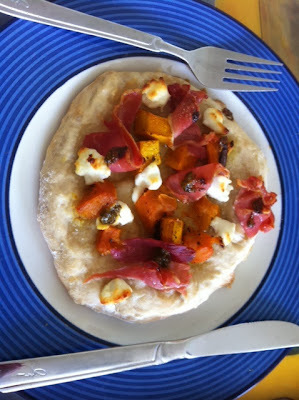 To see what the other Doristas thought of this dish, visit the LYL section of the FFWD website. 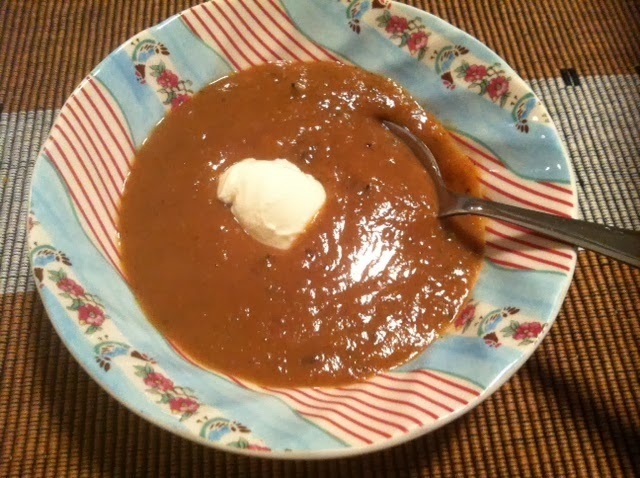 From last week's FFWD chestnut and pear soup, I had both chestnuts and pears leftover. Accordingly, what is a girl to do other than to make baked goods with the leftovers. I chose to make this chestnut cake with pear. I didn't have fresh pears, but tinned pears worked fine. If you find yourself with some chestnut puree that you don't know what to do with, you can't go past this chestnut pear cake. Yup, those lyrics say it all. Until Blogger stops rotating photos and/or provides a rotation tool, you will have to look at some photos upside down. This week's Wednesday with Donna Hay recipe is chosen by Kayte, and is Pumpkin and Goat's Cheese Pizza from p78 of Modern Classics I.
I was in luck because I had a piece of pizza dough in the freezer that I could use to scale down the recipe to a single serve without making more pizza dough for this. And the toppings - devine. Who doesn't like roast pumpkin, goats cheese and proscuitto? I loved this pizza. 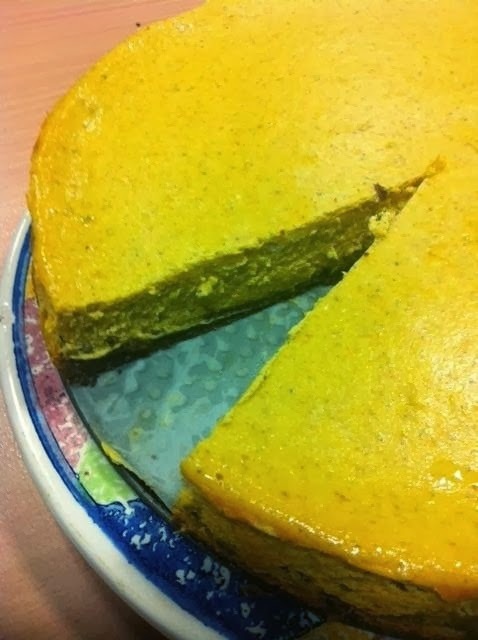 To see what Kayte, Margaret, Chaya and Sarah thought of this recipe, visit their websites. While we were in Hobart, Tim and I had dinner at The Drunken Admiral, a seafood restaurant at Constitution Dock. The cauldron, canon and figurehead at the front of the restaurant set the tone for the internal décor, which is unashamedly nautical. This squid tasted amazing, and comprised calamari rings in a cumin, garlic, oregano and coriander spiced batter with a squeeze of lime and chilli and smoked paprika mayo. I loved the paper cone that the squid was served in. This dish comprised sizzling prawns, scallops and fish, with chips, salad, tomato relish and aioli. Because the sizzling seafood spits, the diner is decked out in a paper bib. This dish comprised a Moroccan spiced salmon fillet in a tomato, coriander and chickpea curry, and was seriously good. I chose it because it was a little off the beaten track of fish and chips. This dessert included a dark sticky barley malt and white chocolate pannacotta with hazelnut shortbread and raspberry puree. Again, it was devine. The feel of this restaurant is casual, so there is no need to get dressed up to go. The wait staff were very friendly, especially our man-bunned waiter with endless energy. However, make sure you make a reservation - a number of people came in after us and were given waiting times of up to two hours to get a table. If you are in Hobart and like seafood, The Drunken Admiral is a must-visit. For French Friday with Dorie this week, we were set a challenge that is difficult to achieve on the verge of summer (though you'd never know it with the crappy weather in Melbourne at present) - chestnut and pear soup. Chestnuts are not common in Australia, even in winter, so to obtain some at this time of year would have required some serious detective work. However, I did have a can of chestnut puree in the cupboard that I had had forever, bought at a time when every second Tuesday with Dorie recipe seemed to require it. So, I reasoned, given that the chestnuts had to be cooked until they were mashable, let's skip that and use chestnuts that are already mashed. I made a half recipe and cooked it for only 30 minutes, given that I didn't have to worry about cooking down the chestnuts, and added a dollop of yoghurt to the top of the finished product. The soup looks like all the other soups I have made out of this book - brown and thick with black flecks. It tasted good, but given the scarcity of chestnuts here, and the fact that I am not a huge soup fan, it probably won't be a repeat. To see what all the other Dorie cooks thought, visit the LYL section of the FFWD website. My blogging activity has been limited recently because I have just come back from a week in Tasmania. Tim and I flew into Launceston, hired a car, and drove down the east coast and explored a few other places in between. Tasmania is one of the most beautiful places you will ever see, as demonstrated by the photo at the top of this post. It is a view of Launceston from Cataract Gorge. Tasmania is as famous for its produce as its beauty, and we tried quite a bit of it while we were there. I was disappointed that it wasn't berry season as there are a lot of berry farms, but there were plenty of other things to try. Below are a few of the random things that I feasted on while travelling through Tasmania. We could smell the bacon cooking ages before the sandwich arrived, and the ingredients just came together to melt in your mouth. The staff at Tombolo were super friendly too. I believe that there was mayo and barbecue sauce on the BLT - as Tim would say, "grouse". This was indescribably fabulous. Tim had the berry pancakes, which were in a similar vein to the crepes - also delicious. Mine came from the Richmond Bakery; Tim got one in Bicheno. These pies have a puff pastry lid, and a pastry shell filled with curried scallops and prawns. I liked this pie very much. The other Tasmanian signature dish that we tried, but which I didn't photograph (because we were eating them in the car in a carpark in Sorrell while it poured outside), is the Kiss Biscuit - two shortbread biscuits sandwiched together with raspberry jam and iced with vanilla buttercream then topped with hundreds and thousands. There is a recipe for homemade ones here. Tim's chicken parma was also enormous. The beers here were also cheap - $3.40 for a light beer and $3.70 for a draught beer. It contained mussels, scallops and fish in a thick, creamy soup, and was served with bread - delish. I have only tried the cherry brandy chocolate so far - it is truly scrumptious! From left to right, they are: lime coconut marmalade, peach apricot Cointreau white chocolate, and plum pudding jam. I am currently eating the lime coconut marmalade out of the jar - it is seriously that good, with its zesty tropical flavours. I also really liked Amanda's blood orange marmalade - but the deal was three jams for $30 and I had to carry what I bought, so I sadly had to leave it behind on this occasion. The coat of arms features two Tasmanian tigers, which are extinct but which feature widely as emblems in Tasmania, including on car number plates. I had a fabulous time on Tasmania, and highly recommend that you visit if you get the chance. This week's Wednesday with Donna Hay recipe is Coleslaw from Modern Classics I, chosen by me. I didn't pay much attention to the recipe until I came to make it, and I found it odd. There was radish instead of carrot, so I swapped back to carrots, and cabbage, parsley and green onion with a dressing based on a whole raw egg. I was a bit dubious about the dressing, but it tasted nice. However, I did not dare to keep it for more than a couple of days, and will use a vinaigrette or the like to use up the dry slaw still sitting in my fridge. This coleslaw tasted quite good - way better than the commercial slaw mixes that I have bought. Knowing how simple this was to make, I'd definitely make it again in preference to buying pre-prepared coleslaw mixes. 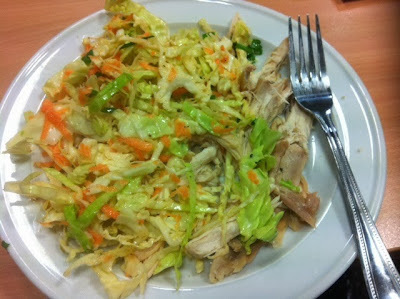 I served my coleslaw with roast chicken, as pictured above. It has been a very tasty work lunch. This week's French Friday with Dorie recipe is Compote de Pommes - the book provides for the compote to be prepared two ways, but I chose the quickest one only, and made a half batch. What is compote de pommes? Well, it really seems to be just apple sauce prepared by sauteeing the apples with minimal sugar rather than by boiling them up with lots of sugar. Instead of the laborious process of straining the soft, cooked apple, I whizzed it up in the food processor. I didn't add any extra sugar other than the tiny quantity that was originally added to the pan, and I didn't add butter. Accordingly, this apple sauce is primarily just apple. I have been eating it out of the jar, plonked on top of my breakfast muesli and as an accompaniment to icecream. All of them are good. As this sauce is not very sweet, it could also be used for savoury applications eg with roast pork. To see what the other Doristas thought of this recipe, visit the LYL section of the website. For Wednesday with Donna Hay this week, Sarah has chosen feta and eggplant meatballs. I have had a strange aversion to meatballs because of their appearance, but after tasting these, I know that it is all in the mind - these meatballs are very tasty. These meatballs do take some prep - you have to chop up and roast eggplant, crumble feta and both shallow fry and bake the meatballs. However, if you are not in a hurry, the result is pleasantly spicy. The meatballs are made with beef mince, although I think lamb mince would work well too, as eggplant and lamb seem like the beginnings of a good moussaka to me. To see what Sarah, Kayte, Margaret and Chaya thought of these, visit their websites. I love the Dining and Wine section of the New York Times, and scour it regularly for new recipes. I especially love it when they publish healthy recipes for me to try. When I saw Melissa Clark's Lunchbox Harvest Muffins, I was in. They contain carrot, zucchini, raisins and coconut. Instead of whole wheat flour, I used spelt flour. These were really good muffins - moist and tender, and as close to healthy as a muffin comes. They are a great idea for kids' lunches, as they hide veges and will fill them up. 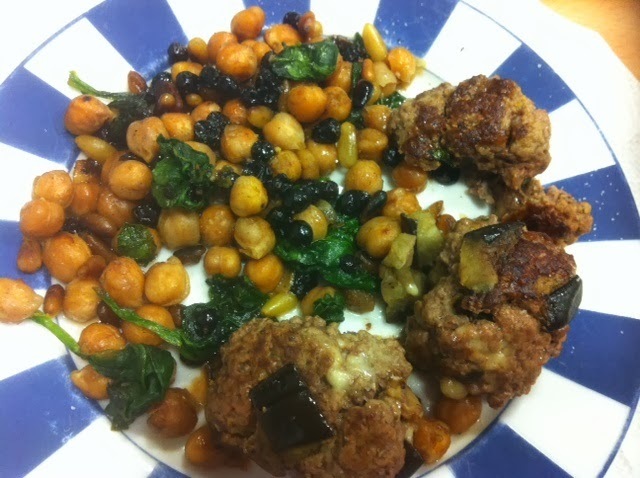 I am always on the look for new and unusual recipes, so as I was casually browsing the website for the TV show, Everyday Gourmet, I was struck by a recipe for chickpeas, spinach and currants. I like all three, but was curious as to how they'd taste together. Of course, I made it! And the verdict? Really good and dead simple to make. I served this with beef and feta meatballs, and the whole dish had an exotic feel to it. The only problem is that there was not enough of this for my liking!! This week's French Friday with Dorie recipe is Hurry-Up-and-Wait Roast Chicken. It's just a classic roast chicken, rubbed with salt and the cavity filled with lemon and herbs if you like, but cooked rapidly at high temperature and then allowed to rest for half an hour or so to allow the juices to run back into the chicken. The resulting chicken had crispy skin and was lovely and moist. I served my chicken with stir fried veges and alas, discarded that crispy skin. I also made the sauce using the pan juices and water, which I thickened with a dessertspoonful of plain flour. What else is there to say - this was roast chicken in the classical way. To see what the other Doristas thought, visit the LYL section of the FFWD website. Life is like a recipe, bitter and sweet, all at the same time, and that's what makes it delicious.